Japan and the UK: Ties That Bind? The bilateral security relationship has seen a flurry of activity of late. But what will come of it? If Japan wants a proper strategic relationship with the U.K., it needs to "buy British warships." That was one point put forward by James de Waal, a visiting fellow at Chatham House, when the august think-tank hosted a seminar on the nascent Japan-U.K. strategic partnership in late June. The seminar was held just 14 months after U.K. Prime Minister David Cameron and then Japanese PM Toshihiko Noda announced the formation of a bilateral strategic dialogue and negotiations on a security information sharing agreement. Cameron and Noda also said that the proof of the pudding, as it were, would be to "identify a range of appropriate defense equipment for joint development and production … and launch at least one program of such defense equipment as soon as possible". 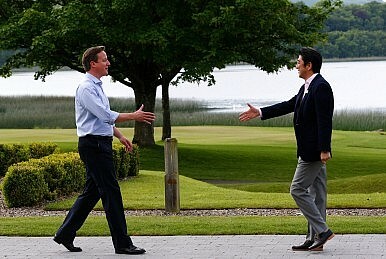 On July 4, at the G8 summit in Northern Ireland, Cameron and current Kantei resident, Shinzo Abe, confirmed this with two documents – a Defence Equipment Cooperation Framework and an Information Security Agreement. They also confirmed an agreement on the countries' joint development of a chemical, biological, radiological and nuclear (CBRN) suit. Japanese officials also said that the agreement included sharing classified information, including military intelligence.. It was with this background that the Chatham House seminar took place. That "buy U.K. warships" was one possible suggestion for improving the bilateral relationship illustrates that, strategically at least, Japan's thoughts about Europe – and Europe's thoughts about Japan – have been in short supply since the end of the Cold War. And despite the G8 announcement and the CBRN suit, that is still the case. De Waal noted that the U.K.'s strategic-military policy in Asia was dominated by "the tyranny of the immediate problem – Afghanistan," while the austerity measures forced on the U.K. armed forces in the 2010 Strategic Defence and Security Review (SDSR) mean it is difficult to imagine London developing a new East of Suez policy that goes beyond its interests in the Middle East. Cold War structures such as the Five Power Defence Arrangements (FPDA) serve an important symbolic role for the U.K. – much in the way that the Commonwealth does – but officials acknowledge that there is little prospect of a British military presence in the Far East that is in any way comparable to the situation at the beginning of the 20th century, when Hong Kong and Singapore were colonial possessions and strategic linchpins. Instead the U.K. is looking to build trade partnerships and expand diplomatic relations (the opening of an embassy in Laos is one such example). Japan, for its part, is looking for like-minded countries across the globe. in late December Abe outlined the concept of a "democratic security diamond" of India, Australia, Japan and Hawaii to contain Chinese aggression; since then he's pushed for closer strategic ties with France, the Philippines, the European Union, and, as we've seen, the U.K. While Abe's rhetorical flourishes against Chinese maritime behavior illustrates Tokyo's short-term concerns, the broader move to create bilateral relationships follows a wider path of "normalization" that can be seen across Japanese foreign and defense policy, which were both outsourced to Washington during the Cold War.